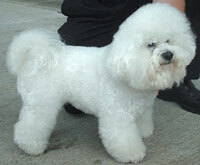 Bichon Frise Dogs - A Bichon Frise (French, literally meaning Curly lap dog)is a small breed of dog. They are popular pets, similar to but larger than the Maltese. They are very intelligent and generally have happy dispositions. The well-bred bichon frise is gentle mannered, sensitive, playful, and affectionate. A cheerful attitude is a prominent hallmark. Most Bichons enjoy socializing with people and other dogs, and are best when there is a lot of activity around them. Those who are considering keeping a Bichon Frise as a pet should know that these dogs are smart and playful, but require a great amount of human attention; they are happy to be the center of attention. Bichons may also be relatively stubborn dogs, yet can exhibit a noticeably patient character. They are a non-moulting breed and are suitable for people with allergies. This information is licensed under the GNU Free Documentation License. It uses material from the Bichon Frise article on Wikipedia.org. Bichon Frise Breeders - Advertise your kennel puppies and dogs here. A and J Kennel - Missouri - Beautiful AKC registered Bichon Frise puppies. Since May 1990, our goal has been to provide healthy, happy, well socialized companion pets for loving homes. Including: first shots, wormings, dewclaws removed, vet check, pedigree, and a two-year limited guarantee. Deposit holds. Shipping available. References upon request. For more info and pics contact Andrea at 417-364-7334. Club Affiliations and Registries: AKC. Summer Knights Kennels - British Columbia - Adorable show-quality Bichon puppies. All our litter trained puppies are vet checked and come with full CKC registration a passport to health, health guarantee, de-wormed, first shots and tattooed.